10" osoraku Tanto made from a RR anchor (1060). The clay was satinite applied approximately 3mm thick, the quench media was warm tap water not hot(maybe 80* farenheight). I gave it maybe a 5 minute soak and the temp was by eye as I don't have a sacrificial magnet but it was done after sundown so I think my temp was right. I used an interrupted quench 4 seconds in, out for 4, then back in for maybe 8. The weird thing was that I didn't feel it ping until after I pulled it out of the water. Could I have possibly saved it by doing a flash temper right out of the water? Either way I rushed it over to my oven at 400* for an hour. I'll pro finish one side to bring out the hamon for practice. Does anyone have a clue what went wrong? i would guess you overshot your temperature before the quench. because i just did this and cracked a blade i was working on... The first time is sounds like you annealed the blade- which as I understand it can cause issues with blade steel. Even working on my small blades and 9" chefs knives ive noticed that even after the 2nd normalization cycle and even the 3rd as the blade is cooling in the air it takes a set or twist or etc. IF it would have been quenched i assume this would have caused a wicked warp or worse. So i now normalize 3 times right before HT to alleviate this. Maybe some more experienced guys would have better educated guesses than i. A couple things are coming to mind, the first is the type of steel. My understanding is that most rail road steel is high in manganese, so not entirely suitable for hamons or water quenching. The next would be that the edge almost seems a little thin, though it is hard to tell from the pics. If going for hamons I would highly recommend contacting Aldo and getting some w-2 or 1075, his w-1 is supposed to be good too. Also I would tend to recommend switching to a fast oil like Parks 50 for quenching. Water works well and produces beautiful hamons, but like it or not your going to crack a lot of blades (even if you do everything right). If you are going to use water then really focus on an even heat. I bring my blades up to temp very slowly, running the forge as low as I can. Mostly I think the type of steel is going to be a continuing problem. 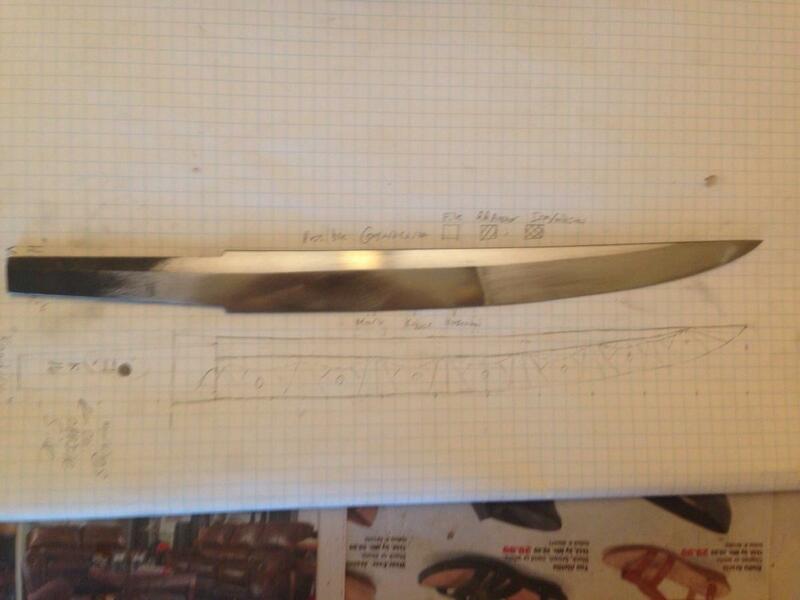 The blade however looked great, the osoraku is a difficult shape to get right and it looks like you had it. If I could give one more bit of advice, it's that you don't have to take the blade to that level of finish before heat treating. Getting the ridge lines right is a lot of work, and just as easy to do after you know you have a hardened blade. Best of luck, I look forward to seeing your future work. Interests:Guitar playing, martial arts, shooting -- well, I like pretty much anything that's pointy, on fire, or exploding. I wish there was a simple answer about how to not crack blades when water hardening...but it just happens. As Gabriel said, you may have overshot your target temp. But that's not necessarily the culprit. 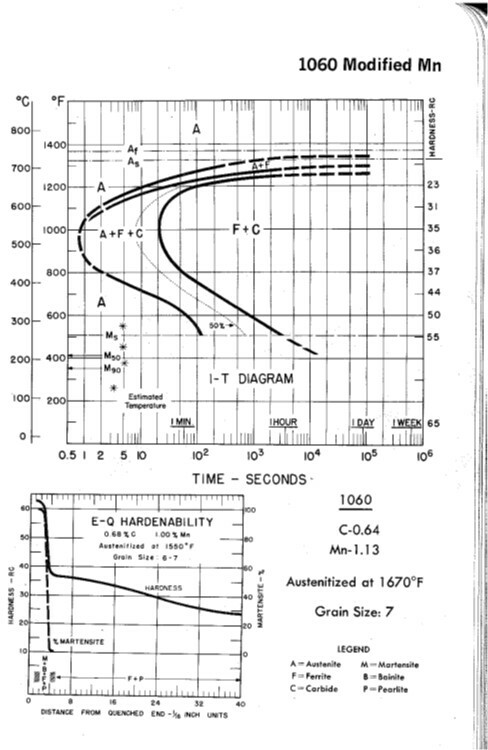 Another thing to bear in mind is that 1060 typically has a higher manganese content than, say, 1050, 1075, 1095, W1 and other carbon steels. This not only makes it a little more susceptible to cracking when water quenching, but it makes it a less-than-ideal candidate for developing interesting and complex hamons. You may have had too much clay on the blade which would have provided a really sharp line as a hamon, or the Manganese is just too high. But polish it out and that will truly tell. You may have ashi hiding in there that you just can't see yet! Since it has come up a little, here are the TTT diagrams for 1060 and for 1060 with higher Mn. 1060 specifies Mn at .6-.9% compare that to Aldo's W-2 at .215%. It's a pretty big difference, and what has made the W-2 so popular. His 1075 is marked as .35% and I notice a difference between the W-2 and 1075. Keep in mind that Japanese swordsmiths are using steel with close to no Mn at all. As Gabriel said, that is annealing, not normalizing. Normalizing is taking the blade to barely critical (watch for the shadows in the steel/decalescence) and allowing to cool to black in still air. Much better for the final microstructure. Three is the magic number, but a couple more cycles won't hurt, especially since you are trying to make this steel as shallow-hardening as it can get. Every cycle reduces grain size, which lowers hardenability and increases toughness. On the charts Jerrod just posted note the grain size is listed as 5-6 and 7. This is medium-fine. Three or four normalizations will take you to grain size 9 or better. I know one guy who got a grain size of 13 (off the scale!) on 52100 through careful normalization cycles. I am no expert on hamon, but my understanding is you want the lowest possible hardening temperature and the water needs to be fairly hot. It is possible to harden a thin blade without cracking IF you use Parks 50 (ask Jesus Hernandez about his trick of doing a fully sharpened blade and cutting paper right out of the quench), but for those of us with mere mortal skills a thicker edge survives better. Finally, make sure there are no deep scratches on the edge to act as stress risers. I have also heard that even the best lose around 10% of their blades in a water quench. If your interested I have a write up of how to make hamons on my website, it is based on information I have gathered over the years from the very talented smiths here and elsewere. It describes the method I have had good luck using. 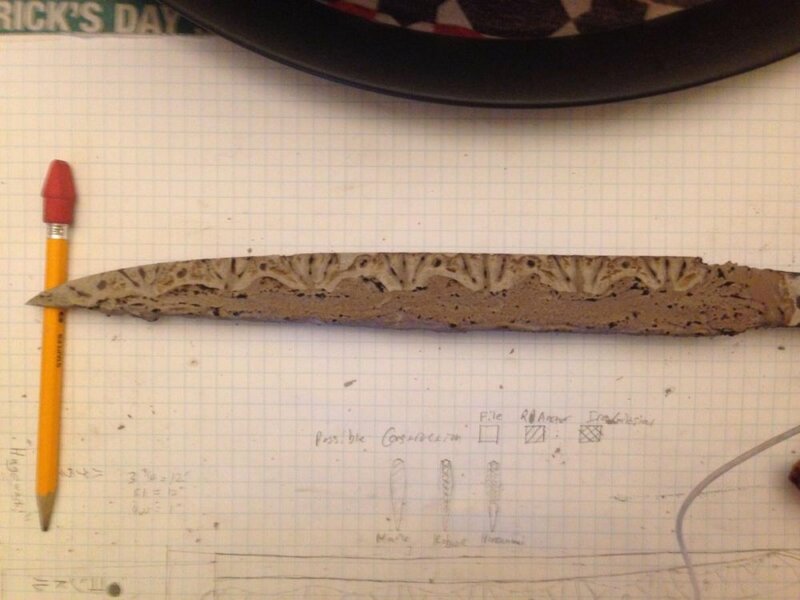 I'll say this, your blade looks great and I'm impressed you're this far along with the forging and shaping. The heat treating is really just a matter of following directions, so once you get the hang of it you'll be well on your way. I would think that means it was close? It's hard to say though, I've had blades survive quenching only to crack sitting on the workbench hours later (so always go straight into the tempering oven!). The reality is that with water, blades are going to crack. Alan mentions a 10% loss, personally I think it's higher. For me, I enjoy forging and I don't make my living with this, so I've come to accept that blades are going to crack. If I was trying to do this as my profession I would have to get some Parks 50. Connor If you have hot spots try plain schedule 40 pipe or whatever and put your knife inside of this for a more even radiated heat. Heating one side or cooling one side faster than the other also causes some humdinger warps. Or you can do the magic wand trick where you bring the steel in and out of the hot spot manually. I have a charcoal forge so i do the latter. Still some skill and a bit of luck involved to get a perfect HT. If i had room i would prefer the former I THINK. I have not tried it personally but it makes solid sense, but seems like you could eliminate some room for error. Time temperature transformation (TTT). As steels go through cooling from austenite down to room temp (or colder) different phases and microstructures form. TTT diagrams are developed by heating a sample above critical and then quenching to a given temperature and held there for a specific time, then quenched rapidly. That sample is then cross sectioned and polished, and the microstructure is analyzed. This is done for several temperatures, and several soak times per temperature (this is a lot of tests). This holding at the various temperatures is what gives TTT diagrams their other (more accurate) name: Isothermal Transformation (IT) diagrams. Imagine one of these tests for the 1060 with high Mn shown in my earlier post: Heat to 1670, quench into a liquid that is at 1000F (it was long ago enough that it could be super-heated lead, but now would be likely done in molten salt). Hold it in this 1000F liquid for 4 seconds, then rapidly cool it to room temperature. Upon examining the microstructure in this sample they see 50% pearlite, 50% martensite. From there they add a dot to their chart with that info. After doing the same test at 1100F for 20 seconds and 600F for 1100 seconds (with all samples having about the same microstructure) the people doing the test can determine where the 50% dotted line should be. They do this with enough variables to form every line that they can. Sometimes this isn't really practical, but they have enough data from other tests to make some pretty safe extrapolations. These are represented by the heavy (thick) dashed lines (like the first line at 1000F at about 0.75 seconds). Generally speaking we want to form 100% martensite then temper it. This gives us the most control over mechanical properties and indeed the best mechanical properties (for blade purposes). 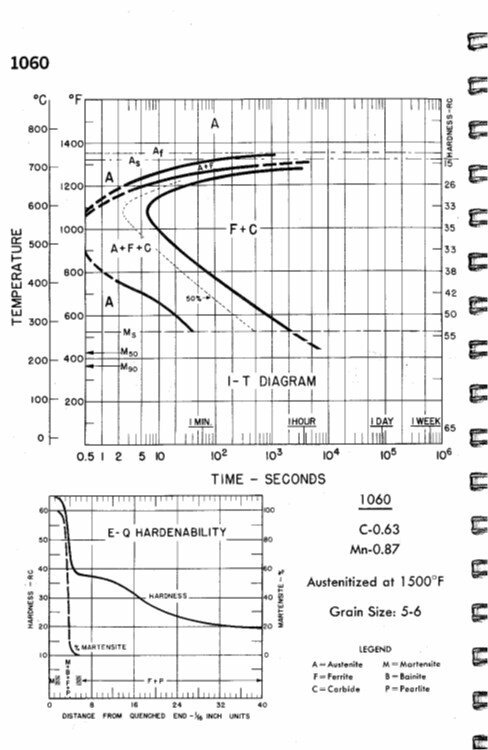 We therefore look to the TTT diagram for where that first nose of the curve is (1000F at 0.75s for this example). We therefore know that we have to get it below that point in that amount of time for 100% martensite formation. It is up to each maker to decide if they truly need 100% martensite, or if say 95% is good enough. For this alloy getting 5% or less ferrite + carbide is a lot easier to guarantee than 0%. 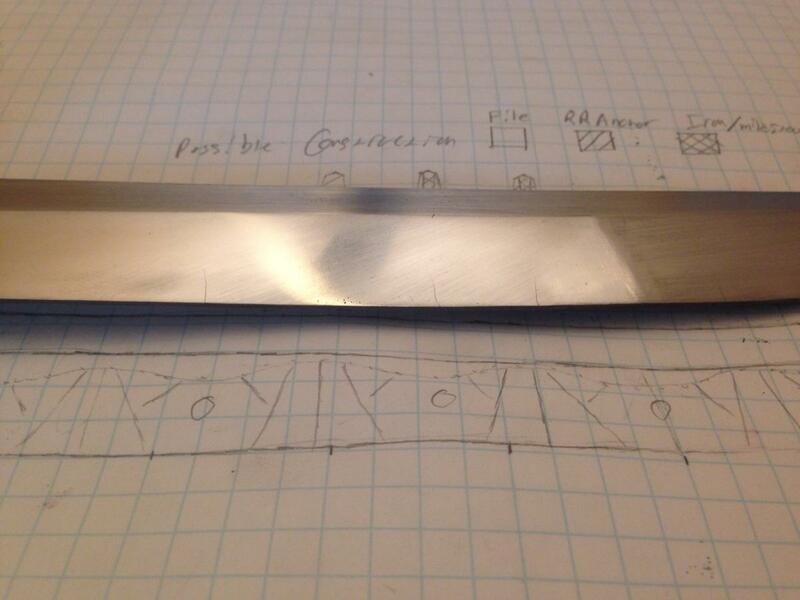 Now, we know that we want to cool blades as slowly as possible to avoid cracking, and even warping. Air cooling is slow, but it is not possible to get (much) martensite that way. Water is very fast, so you get the martensite, but it is fast enough to be dangerous for the blade. The question then is: Can I use something that is slower than water yet still fast enough to get martensite? Most people agree that Parks 50 is a great answer to that question. Personally, I prefer to find an alloy that can tolerate slower still and use canola oil.